Russia shows immense potential for exporting organic foods, but the market needs a regulatory framework in order to progress. Russian producers of organic foods have founded the Union of Organic Farming to lobby their interests. It is mostly foreign companies and farmers that are interested in promoting the $148 million market, in hopes of launching exports of organic foods to the EU. The founders of the union are Russia’s largest privately-owned farms. The union will have 20 members to start with and is expected to number 50 by the end of the year. The Executive Director of the union, Yakov Lyubovedsky, told Kommersant that the organization’s main objective was to lobby for organic farms within the government and promote their sales. The top-priority mission for the union is to create a regulatory framework for the market. “The bio, eco and organic tags are added to packaging just for marketing purposes,” Lyubovedsky says. Euromonitor International estimated the value of the Russian market for organic foods at $148 million in 2012, an increase of 7.8 percent over 2011. Experts project the Russian market for green foods to expand by 30 percent by 2015. The Union of Organic Farming believes the market volume to be underestimated, because Euromonitor only takes into account sales by certified producers. “The thing is that small holdings produce 1.85 trillion rubles’ [$57.97 billion] worth of food, whereas the Agriculture Ministry estimates the entire agricultural sector at 3.37 trillion rubles [$105.61 billion],” says Yakov Lyubovedsky. The largest organic farms produce up to 10,000 tons of food annually and their sales proceeds are estimated at $1-3 million. “Organic farming is a global trend; people are engaged in organic food production in 160 countries, and in 84 of them, they have laws to regulate the market. Yet there is no such regulatory framework in Russia so far,” says Ivan Starikov, Chairman of the Public Council at the Union of Organic Farming. Andrei Lysenkov with Abcert (a provider of European certification services) says that it is mostly foreign businesses that are interested in organic farming in Russia, for they hope to start supplying green foods to the EU. Stefan Duerr, owner of Econiva (one of Russia's largest privately-owned farms), insists that the lack of regulations on the Russian market for eco products is an obstacle to supplying his produce to the EU. “We invite certification companies from the EU, but they are too expensive and our supplies prove unprofitable. If Russia develops a regulatory framework, both domestic sales and exports will become more attractive to farmers in Russia, with its vast lands and immense potential for growing food without GMO, fertilizers or other things used in intensive agriculture,” he says. 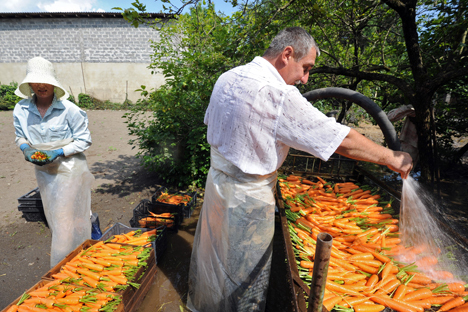 “The demand for organic foods is out of proportion to the supply both in Russia and abroad. The domestic market consumes everything we produce; there is nothing to export, although we have orders coming in from Germany and Sweden, where the demand for regular foods dropped during the crisis, while the demand for organic ones showed a 3 percent increase,” says Chistaya Eda, Sales Director at Borio Almo Walter.